I recently purchased some LC Sugar-free pancake mix from an online seller. At the time of purchase I was so sure that I’d use it up within days because I was going to get up early every morning and cook up beautiful soft fluffy pancakes for hubby and I. Let me tell you…it never happened. It’s difficult enough getting up for work in time to have a decent shower and clean my teeth. Pancakes at 7 in the morning..? EVERY morning…? Nahhhh! So late one night, Mangy started talking about donuts. 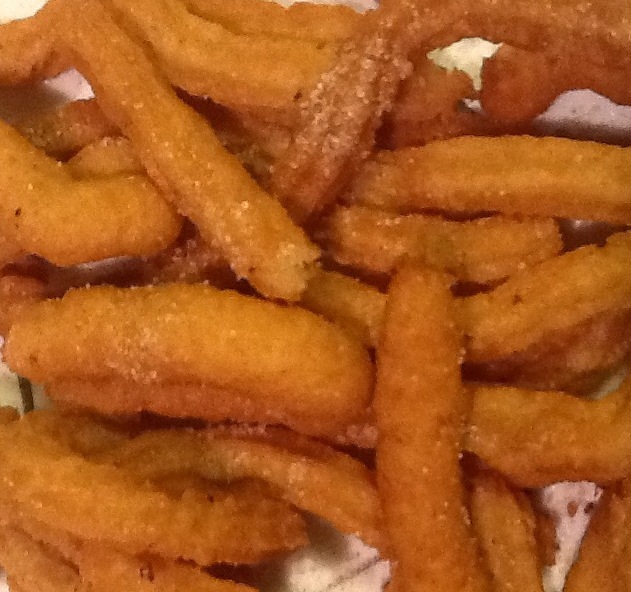 I wasn’t up to it, but I offered to make churros instead. I thought about it a bit more and realised I had a whole bag of LC pancake mix to use up. Guess what? It worked a treat! Soft and fluffy in the middle, but really crisp and crunchy on the outside. The next time I’m going to leave out the sweeteners and add chilli powder and spices instead and fry it a bit longer. I reckon it’ll be a good low carb alternative to Murukku. In a small saucepan over medium heat, combine water, stevia drops, salt and 2 tablespoons oil. Bring to a boil. Stir in flour until mixture forms a ball. Add more pancake mix if needed. Heat oil for frying. Pipe strips of dough into hot oil using a pastry bag and a star-shaped tip. Fry until golden; drain on paper towels. Combine stevia granules and cinnamon. Sprinkle over churros. Enjoy!